Ever feel like your dreamingly dancing to one of Mozart's beautiful preludes? This perfectly glorious dress will take you there. It's based off our super-popular Central Park Dress, and it's every bit as wonderful. Perfect for weddings, spring parties, and really just anytime you want to feel like a vintage princess! This modest dress is sure to inspire much carefree twirling and many happy memories. A lovely sash is included. Very high-quality fabric! Back zipper. All sales final. Jacquard Luxurious Polyester. I chose this dress for myself for my daughter's wedding. I was on a very limited time frame for ordering/receiving as we are missionaries and only home for a few weeks. Holly at Dainty Jewels was most helpful in getting this dress to me in the correct size and on time. It was a perfect fit! The dress is gorgeous and most flattering! I received more compliments than I could count at the wedding ceremony. 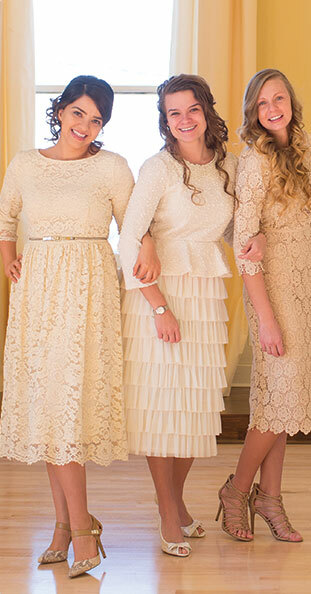 I would highly recommend this dress to my friends. Thank you to Dainty Jewels!